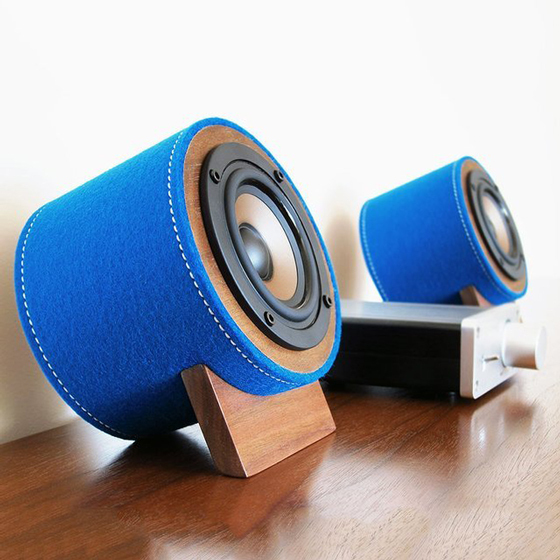 Speaker in these days should not only sound good but also looks good. No matter it is placed at home or taken around with you, having a cool looking is always required. Besides that, waterproof, multi-function or having some visual features such as light show becomes common and common these days. What we’ve got here today is a collection of 17 different sets of speakers with distinct designs. No matter you are an audiophile or just a casual listener, chances are you will be impressed with the uniquely intricate features some of these speakers offer. 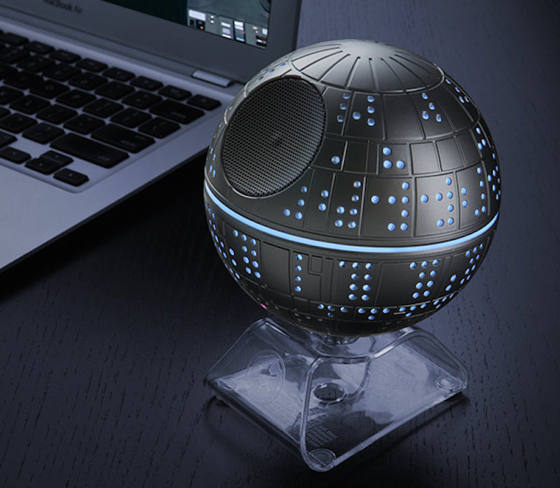 At first glance this looks like a stylish, silver Death Star for display, but it’s actually a Bluetooth speaker. 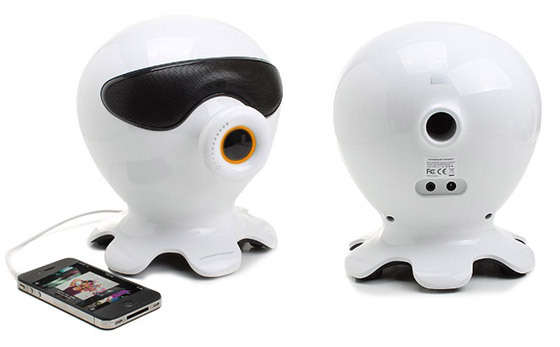 This little speaker produces a huge sound when paired with a Bluetooth device. Once paired, the Death Star will play any audio format, including music, games, and phone calls. The speaker’s range is up to 30-feet away from the source. Introducing the Speaker Blanket! 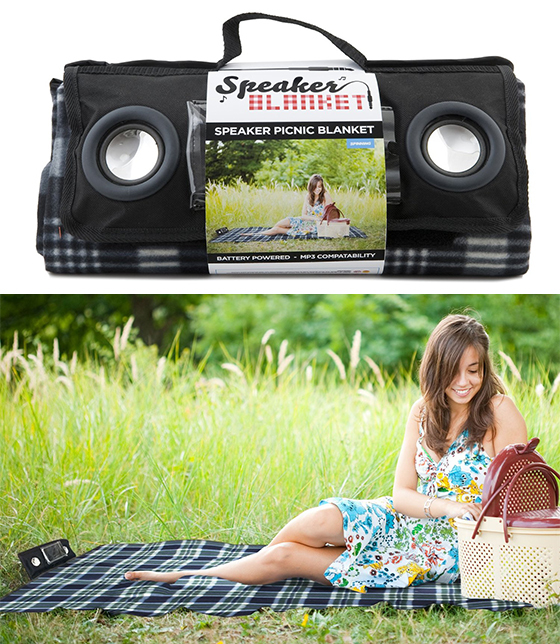 This ingenious new product combines an AA battery operated music system into a fold away picnic blanket so you and your friends will never be without your favourite songs on a hot summer’s day again!The Speaker Blanket allows you to choose your music to match your picnic preference and comes with a handy 3.5mm headphone jack connection. So pack up a hamper, relax in a picturesque location (or just pretend!) and play blissful harmonies until your heart’s content. 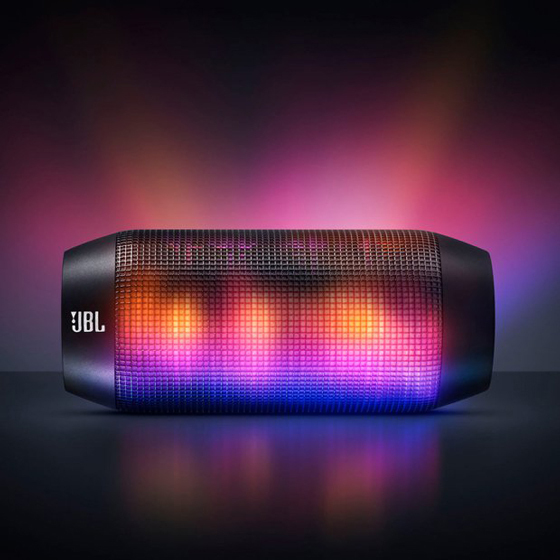 Put your favorite playlist in a whole new light. 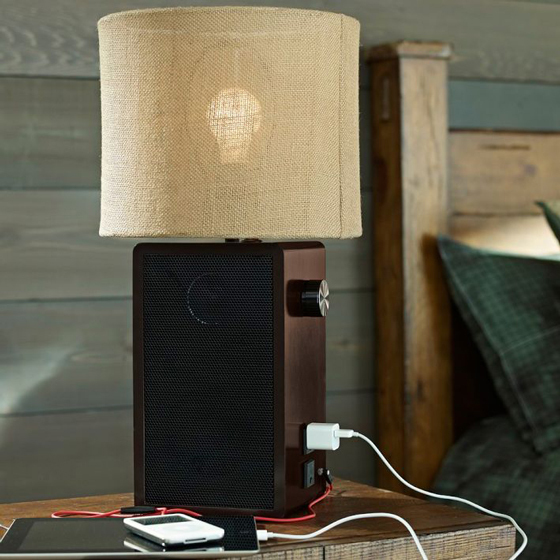 This loud twist on traditional lighting functions as a great desk lamp and high-quality speaker in one – just plug in your MP3 player and rock out as you work. Expertly crafted wood, MDF and metal. Features a speaker with a volume knob. On/off switch located on socket. 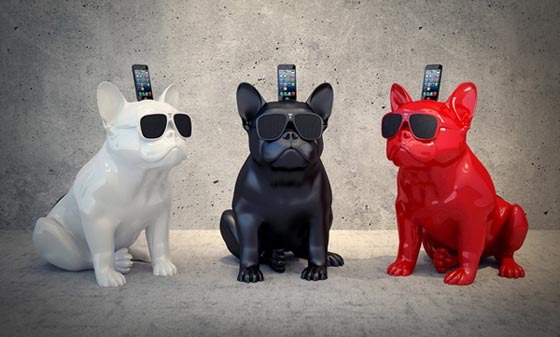 This stylish Bluetooth-speakers for the iPhone called AeroBull from Jarre Technologies, which is perfect for dog lovers. 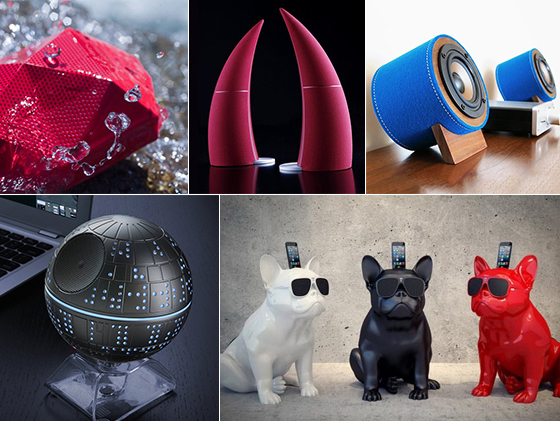 In the shape of bulldog, it offers two speakers, one subwoofer with 100 watts. Designed for use with any iPhone or other iOS device with a lightning connector, this K9 offers high definition sound, a line in for CD players and such, and it supports MP3, AAC, WMA, protected AAC, and WAV files. The material is chrome plated ABS with a painted finish, colors include: white, black, red, gold and silver. Hence, if you can’t have a real dog at home, this will be a perfect choice to sit by your front door and give you high definition sound. 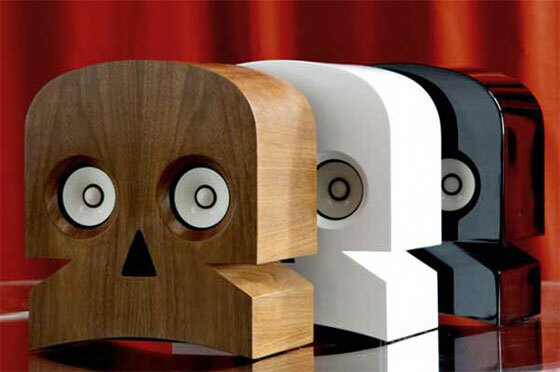 Created by the duo design team of Kuntzel+Deygas, the skull shaped speakers were hand-crafted in France and were intended for domestic use only. You can enjoy the quality sound and design in your home or office. Wrenz Birdies were created with amazing creativity which is rarely seen in such electronic products. It has an output power of 2 W unit, frequency response is 180Hz – 20kHz, and SNR is 85 dB. 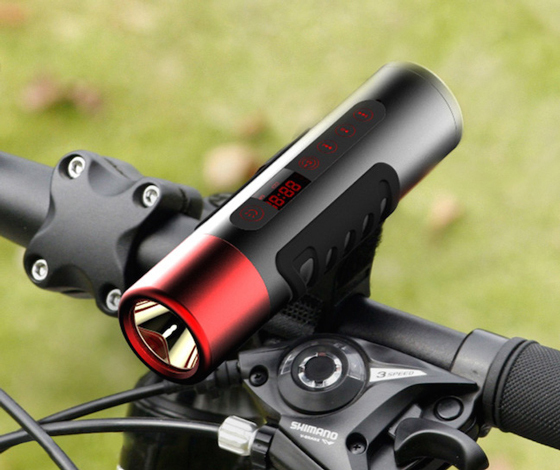 Operating voltage is 3.7 V and it has a 300 mAh battery capacity. You can charge it using the USB cable. Bear necessity. 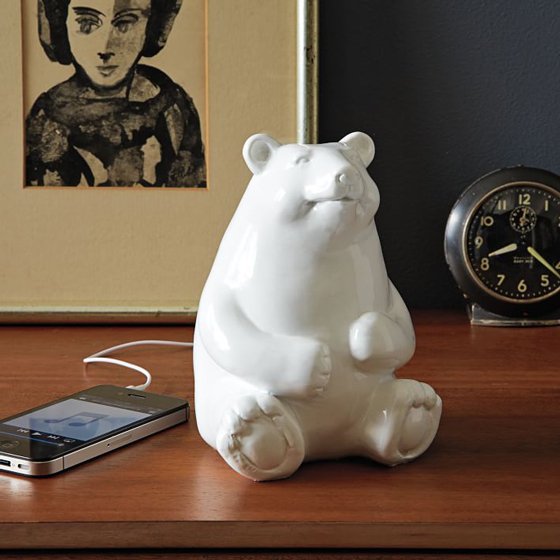 More than just a sweet sculpture, this Ceramic Bear Speaker works with any mp3 player. An audio jack in place of a tail is a clever twist on form following function. Glazed ceramic shell in white. Compatible with most music players using a 3.5mm mini plug. 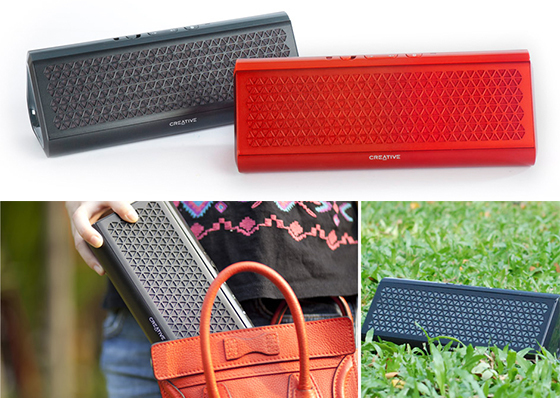 Experience audio made clever with the portable Creative Airwave! This clever Bluetooth wireless speaker, which breaks away from conventional speaker designs, possesses a range of clever features that can simplify your life. You can experience the simplicity of one-touch pairing with the latest Near Field Communications (NFC) technology -simply tap your NFC-enabled smart device on the speaker, and they’re paired. We’ve also added in an invisible microphone for calls, and with its built-in Li-ion battery giving you up to 12 hours of non-stop playtime on a single charge, it’s fully portable. And of course, all these clever features accompany efficient full range drivers for an amazing sounding speaker. These cool new Light Show Fountain Speakers make the music coming from your mp3 player, tablet, phone, or computer come to life. 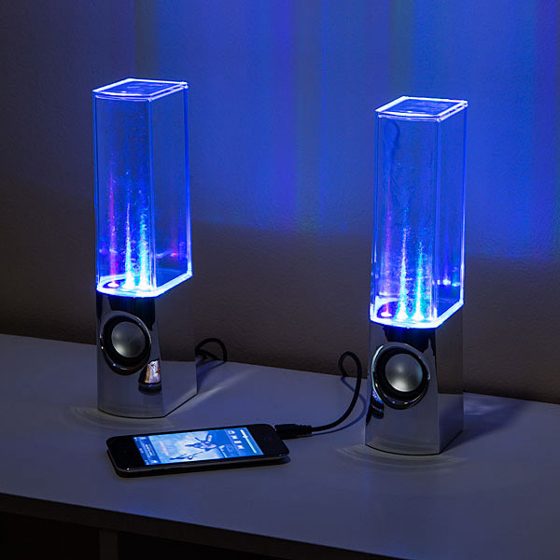 These fun speakers make the water above them bounce and dance to the beat of the music and four multi-colored LEDs light up the water jets as well. They’re like real world digital music visualizers. With customized 16 core high quality speaker & digital amplifier, strong base and perfect sound effect. Glare flashlight with USA CREE LED, long lifetime, 350 lumen, 250 meter lighting distance that provides equal and stable brightness with excellent life. The battery is replaceable, removable & rechargeable. Not a zombie speaker! The ingenious design makes its longer life and safer usage. LED digital display panel and backlight button, easy operation in the dark. Intelligent circuit system with five protection design: wrong polarity, over charging, over discharging, over load short circuit, and over temperature. If you enjoy your music wherever you go then Grace Digital’ s ECOXGEAR line of products is the choice for you. Looking for a wireless Bluetooth speaker system then the ECOXBT is your perfect portable solution. 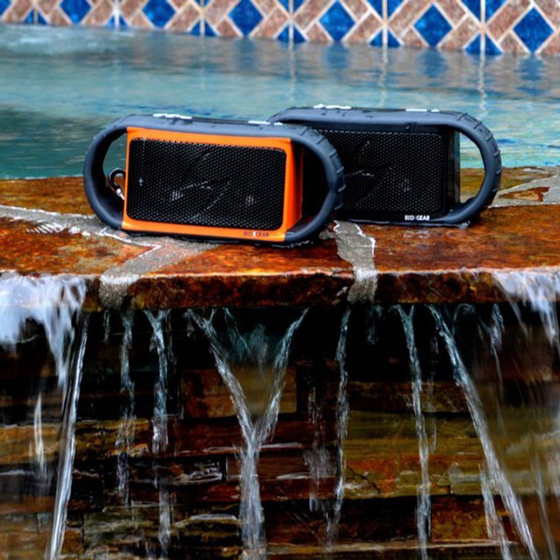 The ECOXBT wirelessly connects to your Smartphone, tablet, or laptop providing a rugged and waterproof mobile Bluetooth speaker and speakerphone solution. 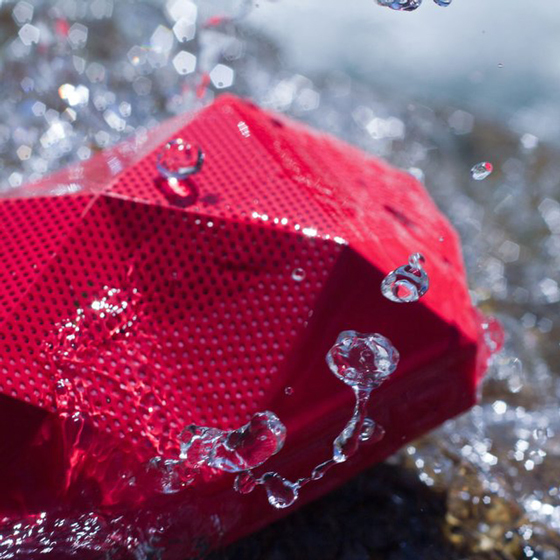 The ECOXBT is not just water resistant but actually 100% waterproof. So don’ t worry if it gets knocked in the pool, falls off the boat, drops into the river, lake or ocean. It even floats! Play the ECOXBT for up to 10 hours via the built in Lithium Ion battery or plug into any wall outlet for unlimited play. For convenient transportation use the built in dual handles or batten down the ECOXBT via the included carabineer for your active adventures. Who says shower time has to be a tedious routine? 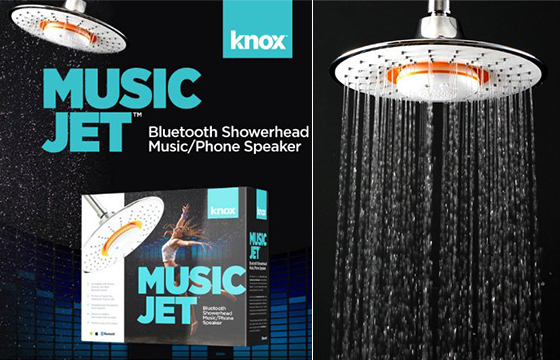 Now you can listen to your favorite songs in the shower and take phone calls too, thanks to the all-new and innovative Music Jet showerhead. Using Bluetooth technology the shower-head/speaker easily connects to your phone. By activating Bluetooth and your smartphone or mobile device, Music Jet will automatically pick up the signal and play all your favorite songs in the shower in a range of up to 10 meters. If you unexpectedly receive a phone call simply press the button on the MusicJet to accept it, the music will automatically stop and your call will be transferred to you. MusicJet takes a single lithium ion battery which is included along with a USB charger; a single charge will last for ten hours of music and phone conversaeless fun.